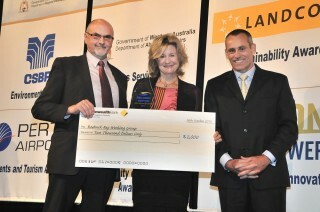 Grant Pearson and Kandy Curran from the RBWG accept an Environment Award in the 2013 WA Regional from Trevor Naughton of CSBP. The Roebuck Bay Working Group has won the 2013 Environment Award in the Regional Achievement and Community Awards for innovative work to reduce blooms of Lyngbya and develop community based management plans for Roebuck Bay. Lyngbya has been worsening in recent years with impacts on the seagrass meadows and the biodiversity of Roebuck Bay. The RBWG formed in 2004 and is currently funded by Rangelands NRM, with smaller projects sponsored by Inspiring Australia and National Science Week. The group’s outstanding community work is aimed at protecting, restoring and maintaining the highly biodiverse catchment that is one Australia’s most important migratory shorebird sites and is a hotspot for Australian snubfin dolphins. The RBWG is currently working with agencies, industry and the community to reduce nutrient enriched run-off from the townsite that can feed blooms of Lyngbya. Other key activities have been lobbying for a Roebuck Bay National Heritage site (declared in 2012), lobbying to divert helicopter flight paths to reduce disturbance of migratory shorebirds, removal of 350 cubic metres of rubbish from the northern shores and raising community, industry and government awareness of the impact of nutrient run-off into Roebuck Bay and providing practical solutions.